This is the download page for the very latest SD card image for ISS-Above HD. Image works with Pi Model 3+ / 3 / Model 2 and B*/B+ and now also automatically detects if the official Raspberry Pi 7″ Touchscreen is connected and it will adjust display output accordingly. Note: If you have received a discount code you will enter that code on the “Checkout” page. The base O/S image used for this download is from the Stretch Lite download provided by the Raspberry Pi Foundation dated March 13 2018. This version is backwards compatible with all prior models of the Raspberry Pi. ALTHOUGH: See the note below on compatibility issues with the original B Rev 1 (256MB RAM). Setup of the ISS-Above is handled via a very simple web browser admin process. No need to connect with the Pi using SSH or do ANY coding as everything can be handled from a browser. SSH access to the image is disabled (to minimize hacking risk). See this Quick Setup video on how the configuration process works once you have written the image to your MicroSD card and started up your Pi. Does this image work with the Pi Zero/W? Yes – this works perfectly in a Pi Zero or Zero W.
*note: The core code works on all models of Pi’s – however there are some issues with the B REV 1 (the very first version of the Raspberry Pi Model B that had limited production quantities). I do not have that version of Pi in my stock – so I am unable to test and diagnose issues with that version. The only issue I have heard of so far is that my code will not support the PiGlow in THAT verison of the Pi. There may be other issues too. 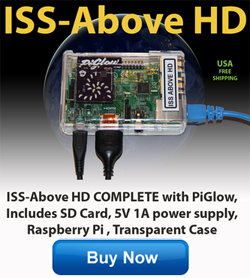 So – if PiGlow support is needed – please use a new version of the Pi .